BRING ALL OFFERS ON THIS BOAT - OWNER HAS LARGE YACHT ALREADY LAUNCHED AND IS WORKING ON A STILL LARGER 3RD YACHT.... THIS BOAT MUST GO!! 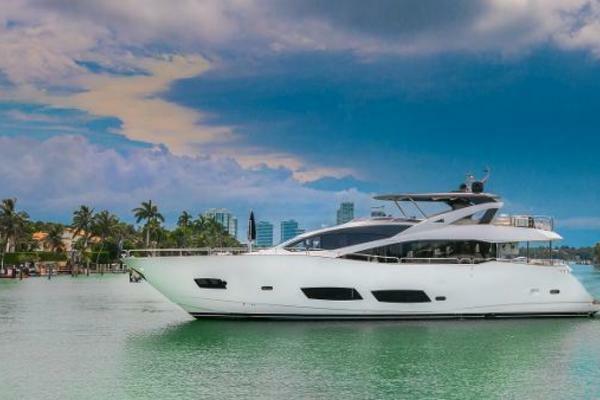 This yacht is immaculate, has a contemporary interior design and has many desirable options. MAIN FEATURES - Enclosed pilothouse/sky lounge (enlarged skylounge from regular Horizon 82) - Large salon with easy seating for 10 or more. - Massive galley open plan style with a country kitchen. - Main deck day head - Master stateroom with king bed, beautifully decorated in modern darkwoods with light fabric accents and shoji screens, ensuite bathroom with his/hers sinks and wet room with shower andJapanese deep soaking spatub. - VIP with King bed, beautifully decorated in modern darkwoods with light fabric accents and shoji screens, ensuite bathroom. - Twin room #1 - Twin room #2 - Crew cabin with twin bedsand full ensuite bathroom, is fitted out to 5th stateroom standards for owner/operators. - Utility room that can convert for more crew space. - Caterpillar C32 engines. - Huge swim platform, which incorporates alift with tender chocks. -Chocks and davit on boat deck for second tender or jetskiposition. - Jacuzzi on sun deck - Full aft deck wet bar with ice maker, fridge, sink and electric cook top. - Bow sun bathing cushions and bow seating The yacht is lying in Japan at present and can be used for Asia/Pacific cruising or shipped to Europe or the USA, or a combination of both. 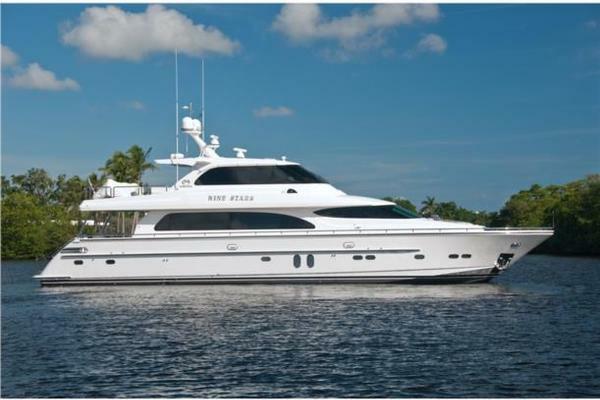 United Yacht Sales New Jersey would love to guide you through a personal showing of this 82' Horizon Motor Yacht With Sky Lounge 2008. This yacht for sale is located in Osaka Japan and priced at $1,980,000. For a showing please contact us by filling out the form on this page and we will get back to you shortly! - Enclosed pilothouse/sky lounge (enlarged skylounge from regular Horizon 82)- Large salon with easy seating for 10 or more.- Massive galley open plan style with a country kitchen.- Main deck day head - Master stateroom with king bed, beautifully decorated in modern darkwoods with light fabric accents and shoji screens, ensuite bathroom with his/hers sinks and wet room with shower andJapanese deep soaking spatub.- VIP with King bed, beautifully decorated in modern darkwoods with light fabric accents and shoji screens, ensuite bathroom.- Twin room #1- Twin room #2 - Crew cabin with twin bedsand full ensuite bathroom, is fitted out to 5th stateroom standards for owner/operators. - Utility room that can convert for more crew space. - Caterpillar C32 engines with 300 hours only.- Huge swim platform, which incorporates alift with tender chocks.-Chocks and davit on boat deck for second tender or jetskiposition. - Jacuzzi on sun deck- Full aft deck wet bar with ice maker, fridge, sink and electric cook top. - Bow sun bathing cushions and bow seating- Caterpillar C32 1800hp x 2300rpm-Stb engine 923 h- Port engine 922 h- 2 xgenerator Onan MDKBS 27.5Kw 60Hz- Stb gen 3306 h- Port gen 3254 h- 2 x 50 amp shore power cords with cable master- Watermaker - Sea Recovery Aquawhisper- Stabilizers Trac 250 / 7.5sq- LOA: 82ft- Max Draft: 6.5 Max Bridge Clearance: 20.5' Displacement: 65 tons- Fuel: 2,250 US GalLOWER DECKACCOMMODATIONS4 Staterooms plus 2 person crew cabinMaster Stateroom is full bean amidships with King size bed and ensuite bathroom with shower, Jacuzzi, his/hers sinks, WCVIP forward also with Kingsize bed and ensuite bathroom.Twin #1 to port with 2 beds ensuite bath (bathroom has extra door for sharing with second twin)Twin #2 with upper and lower twin bunks shares bath with Twin #1Crew cabin aft with 2 bunks and full and good sized bathroom, including separate shower.MAIN DECKLarge salon aft, large open plan galley forward, country kitchen style with forward table for dining.Day head to starboard.BRIDGE DECKSofa with table in bridge plus helm chair and bridge station.Sliding door to outside with boat deck, sofa and top deck Jacuzzi.